This project consists of the structural work for the new 153,000 SF UND Athletics High Performance Center. The new center will be used by every athletics program on campus and will include a 100 yard artificial turf field, a 300 meter eight lane track, spectator seating, a state of the art academic center, a sports medicine facility, and strength and conditioning equipment. This project consisted of extensive demolition including the existing metal stairs and platforms and the addition of prefinished insulated metal panels, 12" thick reinforced concrete masonry, metal stairs, EPDM roof, doors, finished and fire stopping. 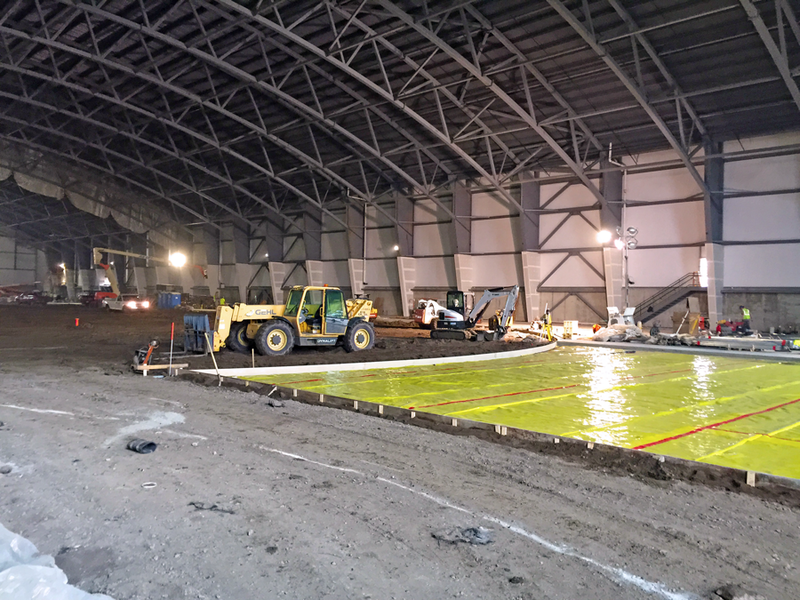 Also included in the contract were concrete foundation walls, reinforced concrete slabs, CMU wall foundations and a manufactured expansion joint between the existing Engineering Building and the New Electrical Building. The 2 story plus basement Unit 1 Electrical Building houses the Upgraded Auxiliary Power System for the coal fired plant. This project consisted of a 2 story addition to the existing fire department apparatus bay consisting of additional apparatus storage, training classroom, office and dispatch space. The addition was constructed of structural precast concrete wall panels, structural steel and steel joists, precast concrete hollowcore planks and slab on grade concrete. Also included in the project was the demolition of the existing fire station training area, the abandoned city hall and the Boy Scout building. This Design/Build project consisted of a new 2500 metric ton cement distribution facility. The terminal was planned as a 200 ton per hour loading and unloading terminal for cement and fly ash from rail and truck cars as well as a truck loading terminal. The terminal went online September 2009 and has met or exceed the design discharge goals. It features storage silos, pneumatic conveyors, high capacity bucket elevator and unique concrete framing assemblies. Also included are ancillary office and support facilities within the terminal. The project was constructed with 5 silos, with provisions for a 6th silo to be installed at a later date. The cast in place silo support frame consisted of a 2 x 3 bay system that utilized 12 - 36" square columns, with 30" x 36" or 36" x 36" concrete beams. A total of 345 cubic yards of concrete was used to construct the frame that is designed to support the six 500 metric ton cement product storage silos. The total volume of concrete for the entire project exceeded 1,400 cubic yards. The ND Ready Mix & Concrete Products Association presented Industrial Contract Services, Inc. with a 2010 Excellence in Concrete (Commercial Category) for their work on the LaFarge New Cement Distribution Center. Designed/built an 83,000 square foot plant for a European firm that manufactures fiberglass blades for wind generation. 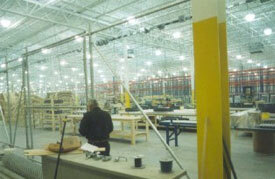 In 2001, designed/built a 38,000 square foot addition. 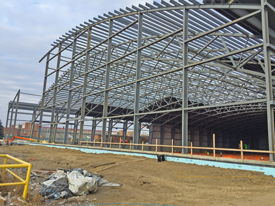 Work included a structural steel frame, metal deck, precast insulated double-tee concrete walls, ballasted rubber membrane roof, a 120’x150’x28’ clear span area equipped with three overhead cranes, a hazardous materials room, precast mezzanine, and a parking lot. “We truly admired the ‘roll up your sleeves’ attitude of ICS, and when others said it simply could not be done, your company stepped up to the plate and did it!” Craig A. Hoiseth, CEO LM Glasfiber(ND), Inc. Designed and built a new 260,000 square foot manufacturing plant including: 150,000 cubic yards of fill and grading, steel frame and roof system, precast concrete walls, ballasted rubber membrane roof, hazardous materials storage, on-site utilities, natural gas heating, compressed air, office space, standby generator, fire sprinkler system, 15 loading docks, concrete access roads and truck ramps, and 275-car parking lot. “The fact that you completed the building on schedule in spite of the ‘Flood of the Century’ is a credit to your entire staff.” Maury K. Peterson, P.E. Marvin Windows and Doors. 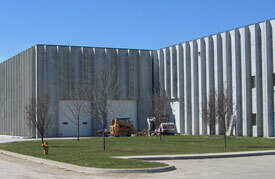 Constructed a 35,700 square foot precast concrete facility. 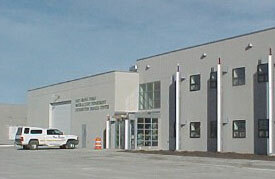 Serves as a two-story office building, parking garage, wash bay, and storage area for the Water, Light, Power and Building Commission of the City of East Grand Forks, Minnesota. Work included concrete footings, excavation, backfill, concrete slabs on grade, topping slabs over hollowcore concrete, drywall package, and rough and finish carpentry package. ICS, Inc.© 2013. All Rights Reserved.